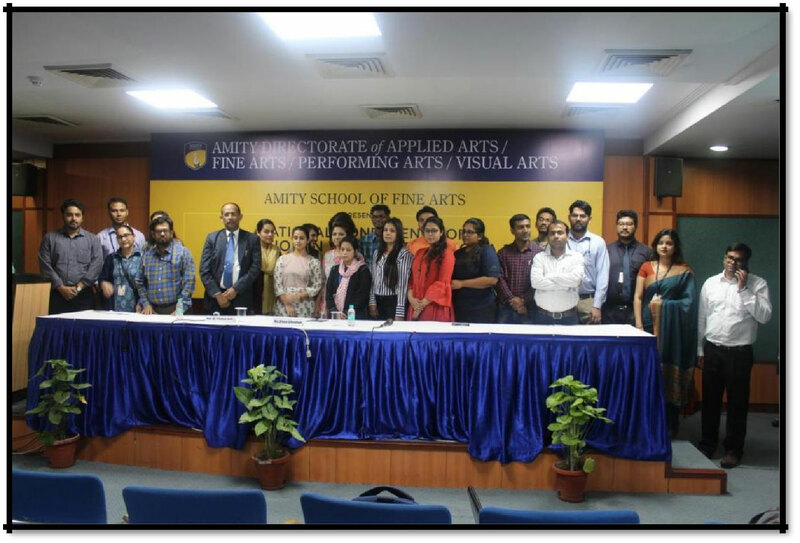 Amity School of Fine Arts under Amity Directorate of Applied Arts/ Fine Arts/ Performing Arts & Visual Arts has organized 3rd National Conference on Innovation in Visual Arts (NCIVA ’18) on the theme: ‘Evolving Paradigms and Practices in Visual Arts’, on 21st March, 2018 at F-1 Block auditorium of Amity University, Noida. 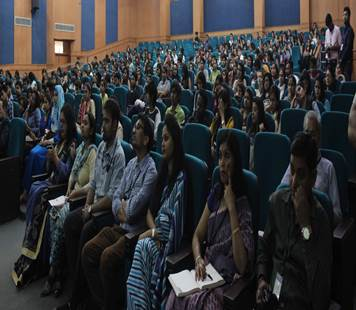 The aim of the conference was to create an interdisciplinary forum for discussing the significant developments in the field of art and art historical research and the event saw participation from various premium institutes and organizations like MS University (Baroda), IIT Roorkee, IIT Kanpur, Lalit Kala Akademi, Delhi, College of Art, Delhi, Lovely Professional University to name a few. 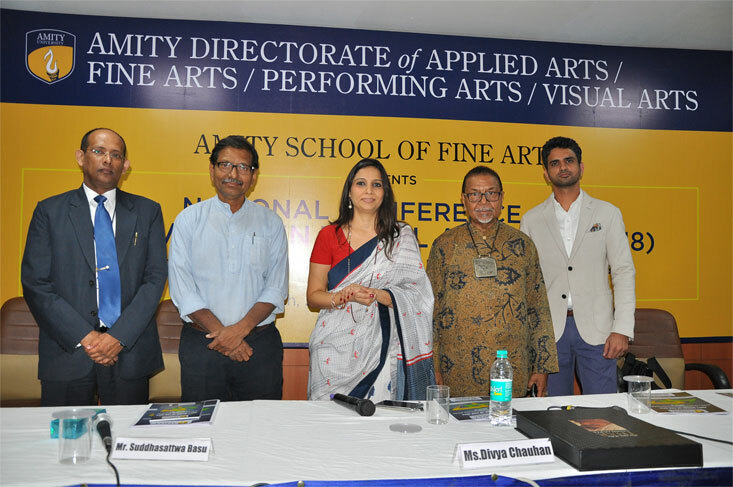 Left to right: Prof. (Dr.) Pradeep Joshi, Director General, Amity Directorate of Applied Arts/Fine Arts/ Performing ArtsVisual Arts, Shri Suddhasattwa Basu, eminent artist, illustrator and animator, Mrs. Divya Chauhan, Chairperson, ASFT,ASFA & ASPA, Mr. Satish Gupta, eminent artist, and Mr. Vivek Singh Sidhu, eminent animator during the theme session. 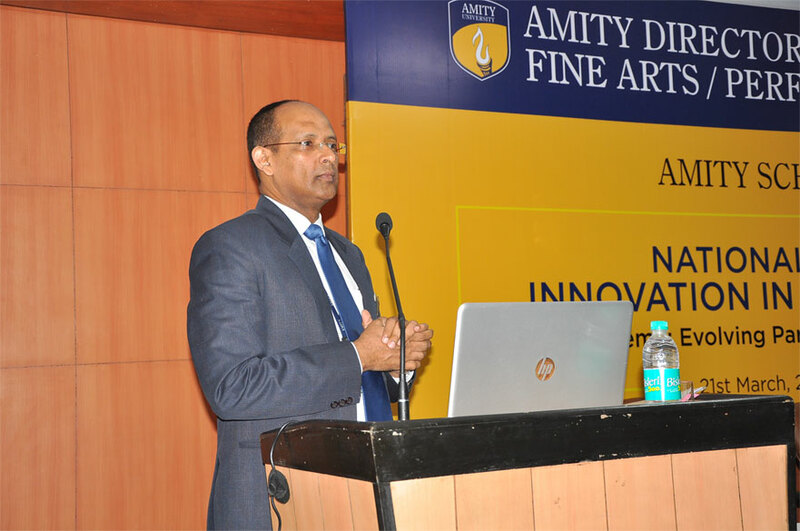 The theme session began with an address by Prof. (Dr.) Pradeep Joshi, Director General, Amity Directorate of Applied Arts, Fine Arts, Performing Arts & Visual Arts. 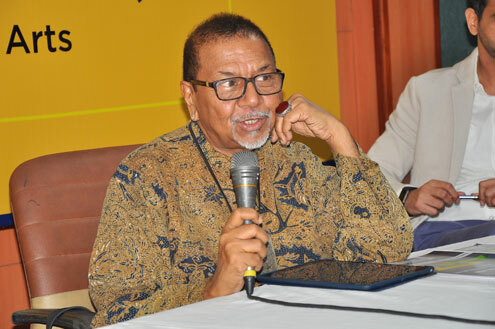 In his opening remarks he stressed on the importance of discussing evolving trends in the field of visual arts as it would pave the way to understand the direction in which art industry is moving in the contemporary scenario. He gave a brief introduction of ASFA and also spoke about the ongoing annual exhibition Kreativ 2018. The guest speakers for the day were Shri Satish Gupta an eminent artist, Shri Suddhasattwa Basu, a renowned painter, illustrator and animation film maker and Shri Vivek Singh Sidhu an animator and founder of Pencillati Studio. The theme session continued with Shri Satish Gupta talking about his works which are majorly inspired by Zen philosophy. He stressed on the honest expression by an artist and also emphasized the importance of scale in making an impression on the viewers. The video clips of his works were a wonderful audio-visual artistic treat for the audience. 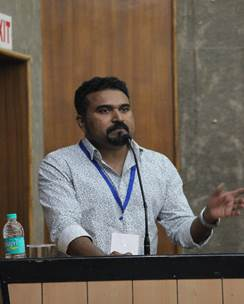 The second speaker Shri Suddhasattwa Basu spoke about his journey as an illustrator and a need to adapt with the changing time for an artist. The interesting shift from manual to digital in his works was truly inspirational and touched a chord with the students. 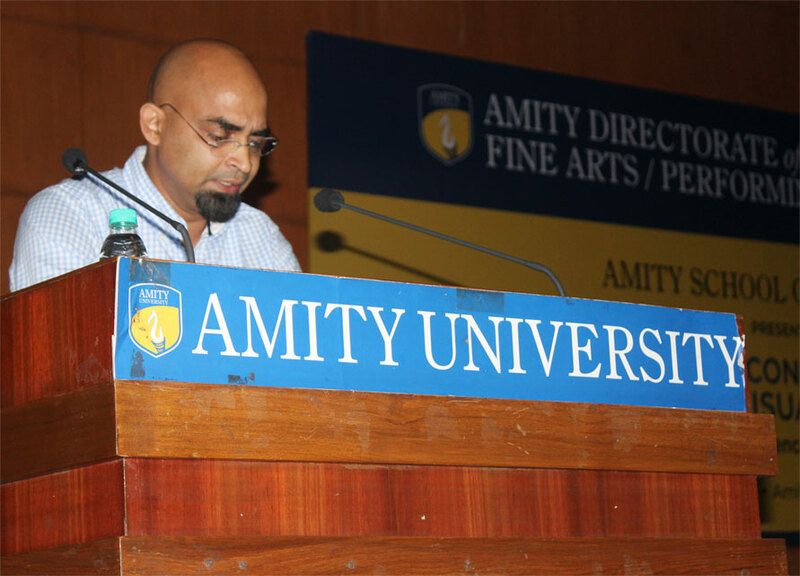 The third speaker, Shri Sidhu talked about the rise of animation industry in India and a need for developing new skills. Clippings of his works that he has created for national and international clients, gave a good idea about the role of animation industry in the contemporary world. 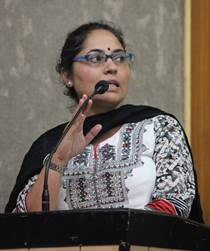 The session was followed by address by Mrs. Divya Chauhan, the respected chairperson of the Amity Directorate of Applied Arts, Fine Arts, Performing Arts & Visual Arts. She focused on the learnings one can glean through the works of our esteemed guest speakers and encouraged students to interact with them. 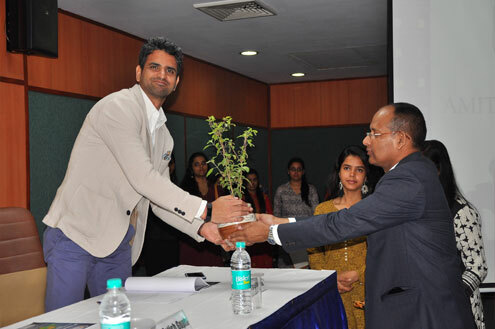 The session was concluded by felicitating the guest speakers with a memento by Mrs. Divya Chauhan and Prof (Dr.) Pradeep Joshi. 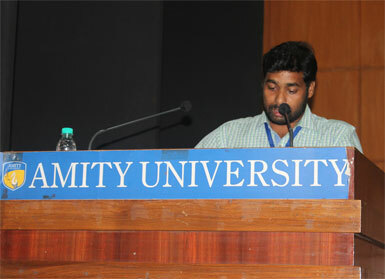 The theme session was followed by oral paper presentation sessions. The first paper presentation session was on the theme: Myth, Legend and Representation in Traditional Art and Craft, Animation and Design. 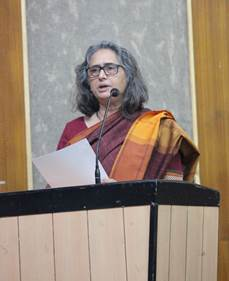 Ms. Masooma Rizvi, Senior Curator and Founder of Belita Design Solutions, New Delhi presented a paper titled ‘Rethinking Traditional Indian Art for Sustainable Global Contemporary Designs.’ The paper focused on how traditional art forms are used in contemporary spaces without compromising its traditional values. Ms. Masooma Rizvi (left) and Dr. Manavpreet Kaur Arora (right) presenting their papers. The third paper presentation session was on the theme: Historic Linkages and Novelty in Painting, Sculpture and Printmaking. 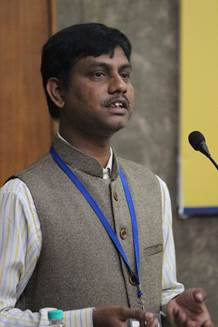 Mr. Ramesh Sapui, a doctoral candidate from Dept. 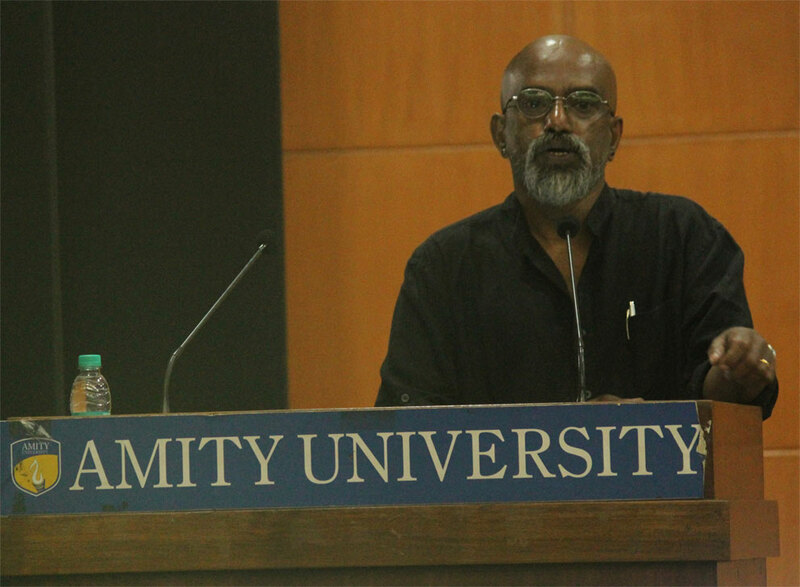 of Visual Arts, Himachal Pradesh University presented a paper titled: ‘The Politics of Material and Trans-cultural Aesthetics in Contemporary Indian Art.’ Mr. Sapui talked about the importance of Subodh Gupta’s works in a pan-cultural and trans-disciplinary context. The oral presentations session was followed by a brief poster presentation session, were the poster presenters introduced a gist of their work on the dais. Following which the poster viewing session was opened for the viewer. 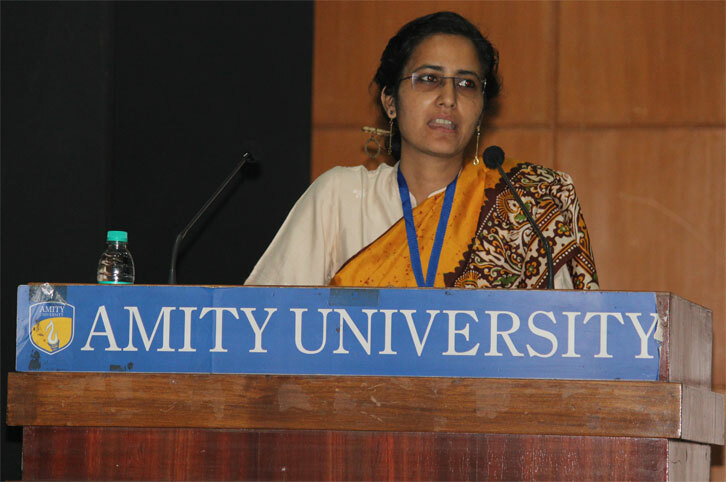 Ms. Anshu Srivastava, a doctoral candidate from Dept. of Fine Arts, Aligarh Muslim University, presented a poster on ‘The Digital Media Arts in Digital India.’ Ms. Jhelum Deshpande, a post-graduate student of Animation Design from MIT Institute of Design, Pune presented a poster on ‘Comparative Analysis of Sanskrit Theatre and Greek Theatre.’ Ms. Bipasha Mukherjee, a post-graduate student of Animation Design from MIT Institute of Design, Pune presented a poster on ‘Comparative Nalysis between Warli Art and Egyptian Hieroglyphics.’ Mr. Excellent Hansda, a fourth year undergraduate student of Architecture from Indian Institute of Technology, Roorkee, presented a poster on ‘Art of Woodcarving in the Temples of Himachal Pradesh.’ Ms. Pragati Pradipti, a graphic designer from Pure Design Solutions, presented a poster on ‘Visual Narratives: Telling a Story through Visuals and Advertisements.’ Ms. Amandeep Kaur Randhawa, a doctoral candidate from Dept. of Fine Arts, Lovely Professional University, presented a poster on ‘Phulkari: The Never Ending Embroidery.’ Event was held in association with XP Pen Ltd & Anupam Jewells Ltd.
Prof. (Dr.) Pradeep Joshi, Director General, Amity Directorate of Applied arts/Fine arts/Performing arts & Visual arts with faculties of Amity School of Fine Arts and delegates of NCIVA-2018 during the valedictory session. 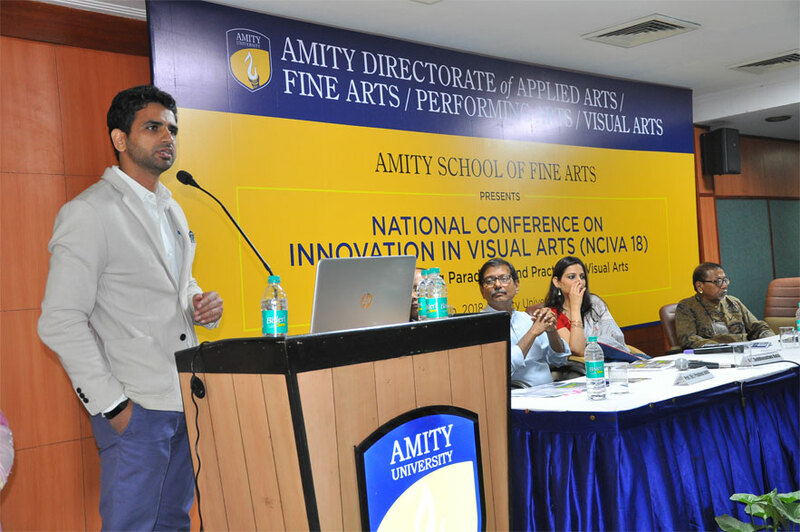 Amity Directorate of Applied Arts/ Fine Arts/ Performing Arts & Visual Arts organized National Conference on Innovation in Visual Arts ( NCIVA’17) . 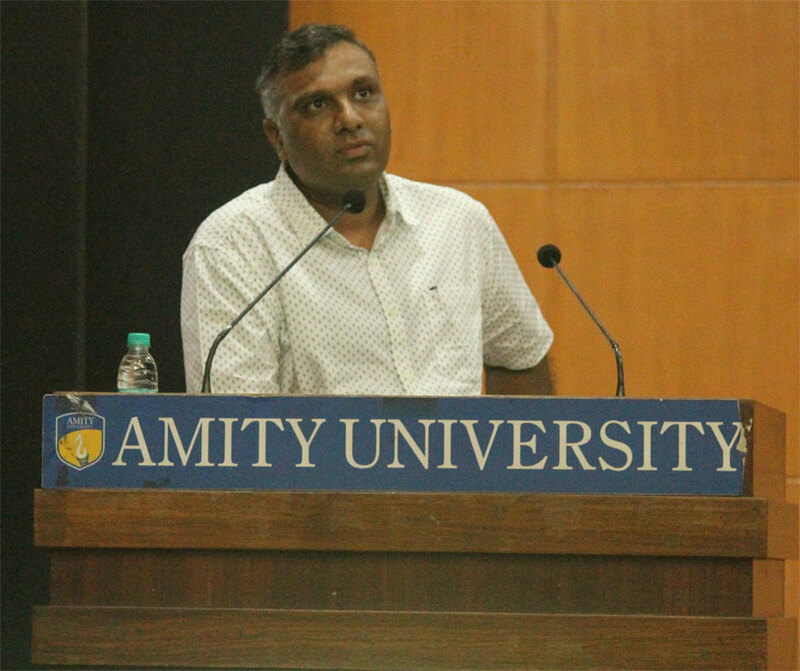 This mega conference organized on 23rd March 2017 was attended by leading industry persons and faculty members from reputed institutes from different parts of the country at Amity University. 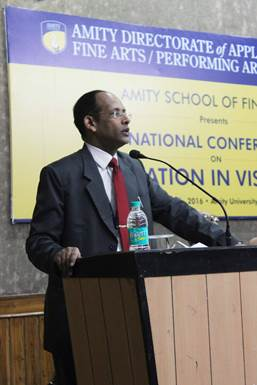 Prof.(Dr.) Pradeep Joshi, Director General, Amity Directorate of Applied Arts/Fine Arts/Performing Arts/Visual Arts in his opening remarks provided the outline of the theme of the Conference “Innovation in Visual Arts”; conference proposes to deliberate on concepts concerning the imaginative and expressive approach to art practice, art appreciation and art management.. 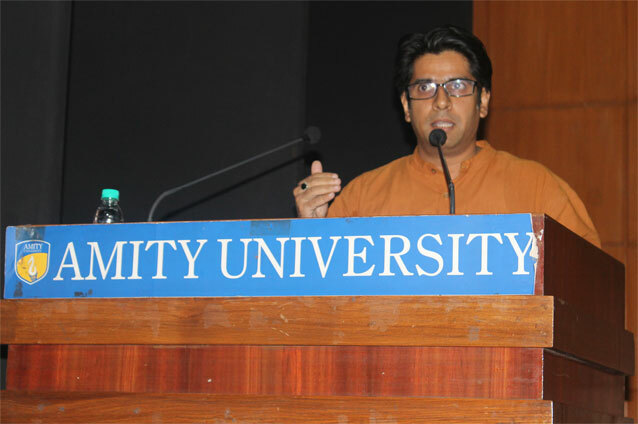 According to Prof.(Dr.) Pradeep Joshi, said that in the realm of arts, imagination has long been considered central to our experience and understanding. He stressed that the practicing artist today has much more than line and color at their disposal to give vent to their imaginative feelings. He apprised that the global market for art has shown a slight decrease of 2% hence there is a need for continuous innovation to excel and grow in market. V.G focusing on his journey as a versatile artist presented a glimpse of his artistic oeuvre. He talked about his experiments with abstraction and how it created his specific minimal visual language. He also talked about his latest curatorial venture at ‘World School of Design’ and what it means for a practicing artist to enter the world of curation. a renowned visual artist explained the concept of innovation in visual arts and its growing importance. He talked about few important artist of 21st century and their innovative methods like shadow painting and venture into digital world. He stressed at the importance of such innovative practices for upcoming artists who are trying to carve a special niche for themselves. Ambient advertising is communicably more penetrating as it connects heart to heart and experience to experience creating an emotional bond. It brings personal reality and experience in the foray of media reality. He presented various relevant and interesting videos to highlight his point. 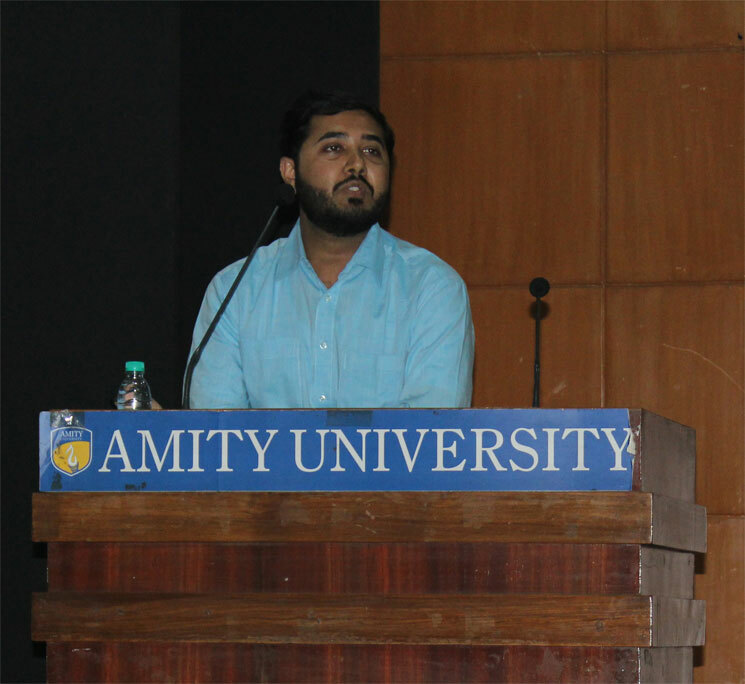 Mr Aroop Dwivedi’s paper revolved around the theme of ‘performance’ in animation. 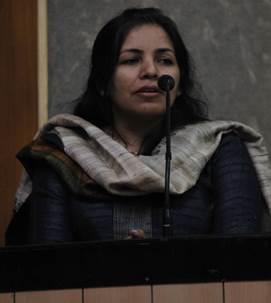 Dr. Maneet Kaur presented a paper which focused on the floral decoration at Darbar Sahib. 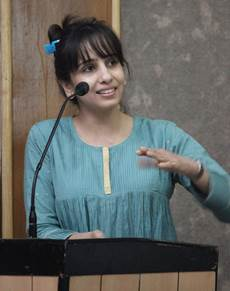 Her paper discussed about the visualization of painters, unique feature and characteristics of the floral motifs at the Darbar Sahib. It also put forth the traditional process, significance and methods and mediums and significance of creating floral motifs in the fresco paintings. paper focused on the Performative Narrative paintings in Indian Folk Art. 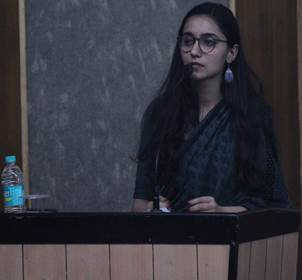 She mainly focused on the collection from the ‘Sanskriti Museum’ Delhi and her interest was generated mainly by observing both Phad and Kavad paintings. tried to describe the idea of non-traditional visual art practices and its aesthetical values to Odia artists in his paper. Analyzing art works of various artists from Odisha, he explained the idea of non-traditional visual art movement and its aesthetics. He also discussed the pedagogic system of visual art institutions in Odisha. 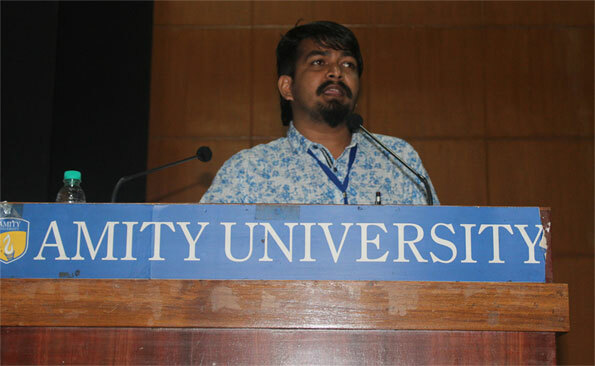 There were Poster Presentations by research scholars from various universities like Aligarh Muslim University, Lovely Professional University and Andhra University. Visual Communication, Creative technologies and changing paradigm. Philosophical/ Aesthetic approach in visual arts. Graphic Design and innovation, Lettering and Typography. This conference aims to bring together the prominent Academicians, Graphic Designers, Practicing Artists, Research Scholars and Gallery Professionals to discuss various facets of visual art and its changing paradigm in 21st Century. 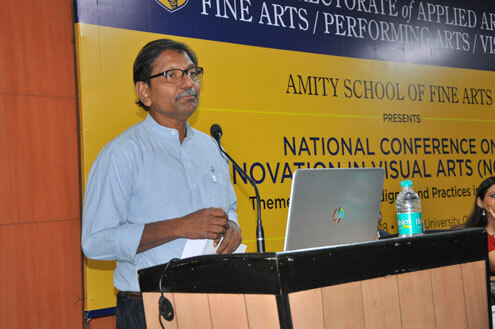 Amity Directorate of Applied Arts/ Fine Arts/ Performing Arts & Visual Arts organized National Conference on Innovation in Visual Arts ( NCIVA’16) . 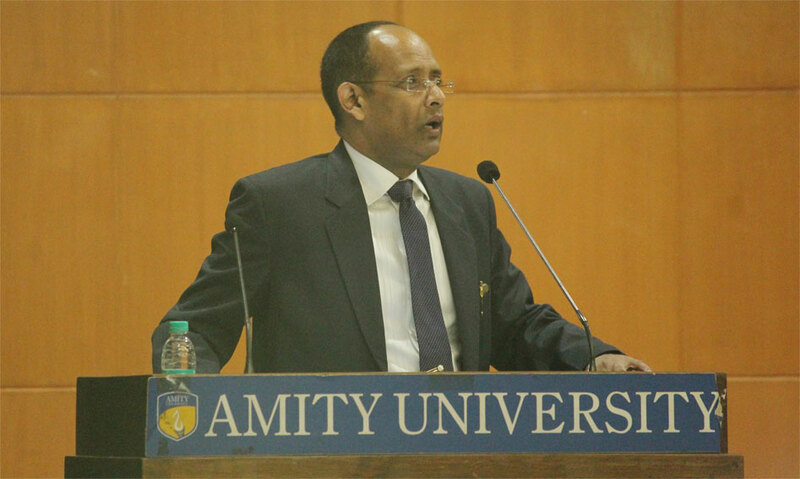 This mega conference organized on 17th March 2016 was attended by leading industry persons and faculty members from reputed institutes from different parts of the country at Amity University. 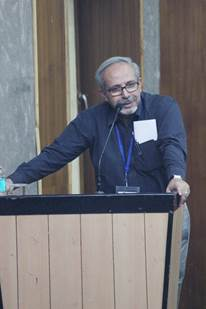 Prof.(Dr.) Pradeep Joshi, Director General, Amity Directorate of Applied Arts/Fine Arts/Performing Arts/Visual Arts in his opening remarks provided the outline of the theme of the Conference “Innovation in Visual Arts”; conference proposes to deliberate on Socio-Political Impact on innovations in Art Education and Practice and Creative Technologies and Interactive Art Practice. According to Prof.(Dr.) Pradeep Joshi, one of the most important parameter is advent of ecommerce or online business due to which world is gradually becoming global village. This poses opportunity as well as challenge for Artists, Art buyers as well as art galleries and require them to prepare and plan for being competitive in art market. In the light of the above it is important for Artists to continuously innovate for success which can be summarized under "Innovate to Excel". He also elaborated innovative steps being undertaken by Amity School of Fine Arts under Amity Directorate of Applied Arts/Fine Arts/Performing Arts/Visual Arts to promote Arts. 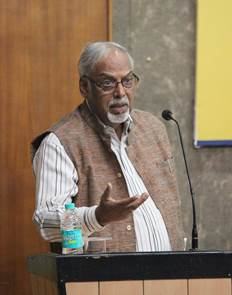 Mr. Banerjee's emphasis was on chaos of urban life. Focusing on innovation he distinguished between a leader and a follower. He shared his passion for the wonderful book 'The Little Prince' and the quest for innovation which is there inborn in us and which dies gradually as we grow up. He stressed on the fact that a true artist needs to keep the child alive in him/her to be able to actually innovate. Ms. Guha talked about the innovation in the art industry in last ten years and kind of work happening today in any visual media. She focused on developing the ability to interpret the creative thought. The importance of technology and knowing how to use it comes handy to the creative minds. By using modern innovative methods an artist can gain an edge over others in the field. Mr. Scaria talked about issues surrounding migration and shared his innovative works which deal with the pressing social problem. His technically sound video works deliberated on various social issues in a creative and subtle manner. Visually engaging ‘Prisms of Perception’ and ‘Political Realism ‘ highlighted his thoughts efficiently. 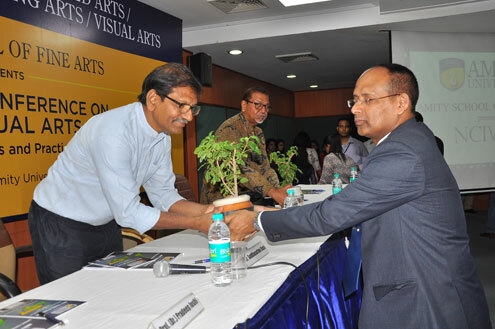 Prof. Lahiri talked about engaging all the senses in creation of an art work. He suggested that an artist has to go beyond what he sees around and cull out images from his imagination. 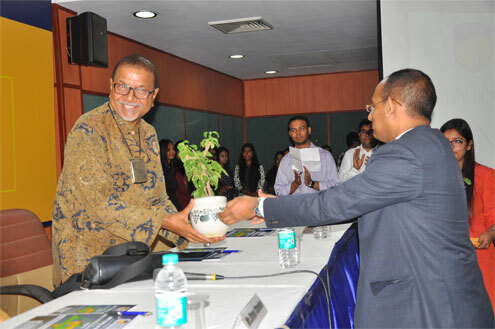 He also talked about how art today has become interdisciplinary especially due to technological advancements. Dr. Kazmi talked about Innovation in Art historical pedagogy in Contemporary theory and practice. She stressed on how art is about social inclusion and how theoretical paradigm helps in creating spaces for art. Critical understanding of Art history helps a practicing artist to develop a much better sense of art practice. Ms. Mathews talked about how NIV Art centre helps to promote innovative ideas in art. The centre promotes contemporary experimental works and also works for creative education of children. 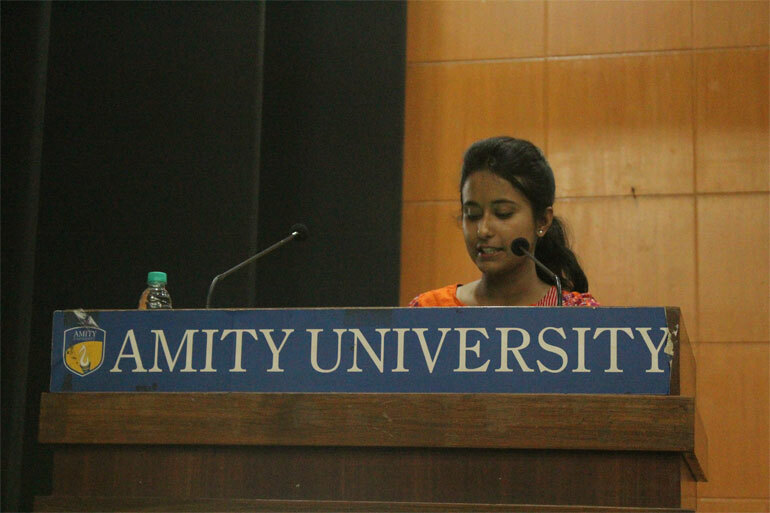 Ms. Chetna Verma talked about her artistic journey and her fascination with lines and abstraction. She shared her recent works of installation and video works focusing on the play and intermingling of lines. 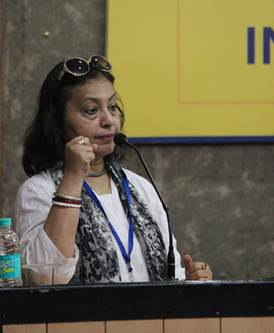 Ms. Singh talked about developing, archiving and coordinating the annual programmes, grants and workshops at FICA .